Defense Minister pessimistic about Israel-Palestinian conflict, says it has no solution so long as the PA incites against Israel. 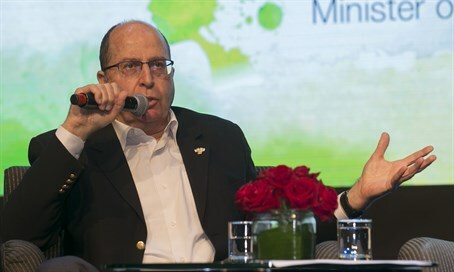 The conflict with the Palestinian Arabs will “never be solved” so long as the Palestinian Arabs continue to incite their children against Israel, Defense Minister Moshe Ya’alon said Thursday. Speaking at the World WIZO conference in Tel Aviv, Ya’alon hailed Israel’s success in stopping mass terrorist attacks, a success which, he claimed, has caused the enemy to change its plans and carry out “lone wolf” attacks. "Due to our success in preventing mass casualty terrorist attacks, our enemies are employing attacks by individuals. We will defeat this wave of terror as well. Israel has the ability to cope with any challenge and develop security measures to protect against all forms of terrorism," he stressed. He then went on to express a pessimistic view of the conflict with the Palestinians. Ya’alon also referred to the Hezbollah terror cell from Tulkarem which was exposed by Israeli security forces and was operating under guidelines received from Juad Nasrallah, son of Hezbollah leader Hassan Nasrallah. "Hezbollah is indeed operating in Judea and Samaria, as do other terrorist groups such as the Islamic Jihad; they are all metastases of Iran. Hezbollah, via Iran, is trying to lure Palestinians and Israeli Arabs to carry out terror attacks within Israel," he said. As for Iran, the Defense Minister said that Iran is the greatest threat to Israel today, repeating comments he made earlier this week. "While the nuclear program is currently suspended due to the agreement with the international community, within 10-15 years and possibly earlier than that, when they feel comfortable financially, they will continue to develop nuclear weapons," he warned. Meanwhile, stressed the Defense Minister, the Iranians are working to arm Hezbollah with missiles and weapons. "They finance Hamas in its jihadist war against Israel, and are also working along the northern border," he said. Finally, Ya’alon stressed the importance of Israeli public diplomacy within the international community in order to combat the Palestinian propaganda. “The Marmara which was sent under the auspices of Turkey was made up of jihadists, European statesmen whom I call naive, and anti-Semites,” said Ya’alon. "When an Israeli officer ordered the Marmara to retreat, the answer he received was ‘go back to Auschwitz.’ The Marmara is an expression of the spirit among some members of the international community who are acting against Israel. The propaganda war is very difficult because it is driven by widespread anti-Semitism and delegitimization of Israel, and so it is hard to fight it,” he added, noting that the international community does not understand how much it is led astray by the pro-Palestinian propaganda. "Israel's public diplomacy war requires each of us to become a warrior on social networks, and to speak up for Israel. I call on you, the women of WIZO, to take part in this fight,” said Ya’alon.